3 new exciting pieces to add to your heirloom Victorian Slide I bracelet. 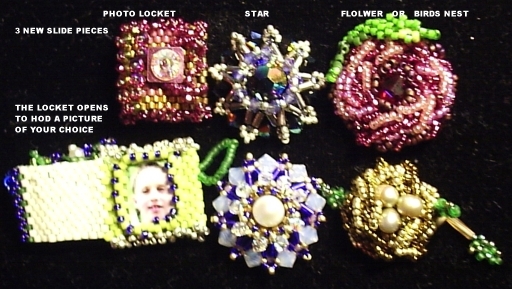 Create a locket slide that contains pictures of your loved ones. Add a crystal star that radiates with fire to your bracelet and finally make either a victorian tea rose or a birds nest to complete the piece. A photo (head shot) resized to 1/2 an inch or .5 inch by 1/2 1n inch and printed on regular paper.Cut the picture out and sandwich it between 2 pieces of clear packing tape. You can email a picture to me to do this for you. sequins, 3mm pearls, 3mm crystals, charlottes, small flowers or leaves.